2. Page length also decreases, it makes easier to scroll up and down. 3. Hide comments to save space especially when viewed on mobile devices. It makes the page much cleaner. For normal website, you can use ‘Universal Embed Code‘ which loads and displays Disqus on your site, typically on the individual article or post pages. Here, it is customized code to load on click. 3. On page “Show/Post Comments” link is displayed and on click, comments will be loaded. 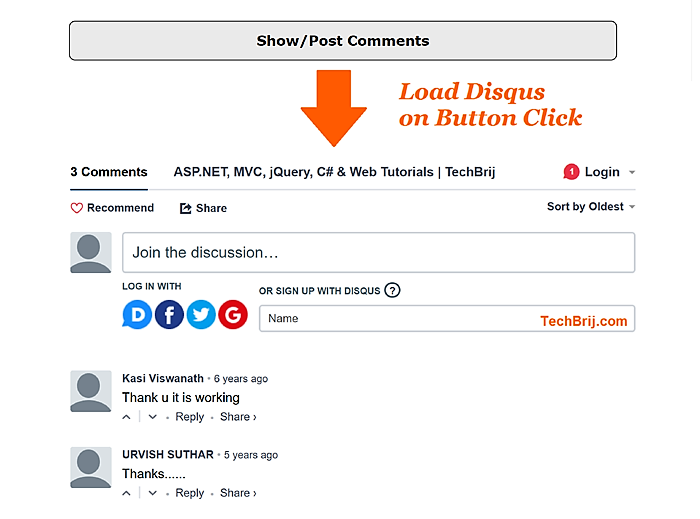 If you are using “Disqus comment system” plugin in WordPress and want to load Disqus comment on click then we have to implement in such way so that the existing comments must not be lost on new display. That is the main objective for this post. 1. If you are using “Disqus comment system” plugin, disable it. 2. Remove comments section of your website. Either you can update the above code or update the comments template page (generally comments.php). In wordpress single.php, generally $post is used for current post depends on theme. Update it according to your theme. Now you can test your site, click on “Show/Post Comments” to load comments. 1. No one wants to do extra click for commenting, so less contribution in comments. 2. Not good in terms of comments crawling by search engines on website. 3. In my personal experience, I get drop in Alexa ranking. In this post, we saw how to integrate Disqus into normal websites and WordPress without impacting the existing comments. If your website is not getting much comments or it is not so important then It is very useful to load it on demand.